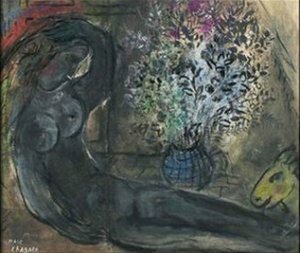 A painting by preeminent Russian-Jewish artist Marc Chagall that was stolen from an American yacht anchored in an Italian port over a decade ago has resurfaced hanging on the walls of former Juventus striker Roberto Bettega’s house in Turin after being tracked down by Italy’s art-theft police squadron. Italian authorities have been quick to absolve Bettega, who bought the painting in good faith from a gallery in Bologna back in 2003. Bettega (who played for Juve several hundred times between 1969 and 1983, picked up 45 caps for the Italian national side and is currently employed as the Bianconeri’s deputy director-general) was said to be unaware that the painting was stolen from an American-owned yacht which had been anchored for repairs in the northern port of Savona and had no idea the gallery he bought it from was a clearing house for stolen artwork. According to Italian news coverage, the thieves replaced the original painting on the yacht with a copy and then hoodwinked the Chagall Foundation into providing a new authentication for the stolen artwork. We’re fairly sure there’s a joke about dodgy Juventus directors in there somewhere but frankly we’re not willing to make it on legal grounds. Sorry to come off as a troglodyte but 1.2m euro for that? You could get samba to be your butler for 3 months with that kind of money. Should have stopped painting after the flowers in vase were finished.